#2,686 Rainy Organizing. – Laurel Mercantile Co.
Now reading: #2,686 Rainy Organizing. We were under a blanket of heavy storm clouds from the time we woke up this morning, threatening without so much as a rumble. 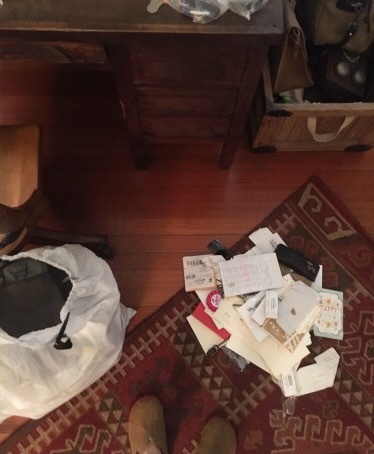 After church, the rain began to fall and only stopped for a couple hours this afternoon, and for whatever reason… Being at home in a storm made me feel like cleaning up the desk junk drawer and the drawer where I keep letters and cards from friends and family over the years. It’s something I’ve been meaning to do for so long, but who in the world makes time for that? I’ll tell you who. I do!!! Well, I mean not the kitchen junk drawer though. Ain’t nobody got time for that. Also, we watched The Founder, which is fascinating if you have any entrepreneurial inclination whatsoever. #2,685 Out in the Woods.